Jeff Littlefield, quarantine director of MSU's Biological Containment Facility, has received the Barb Mullin Lifetime Achievement Award from the Montana Weed Control Association for his efforts to manage noxious weeds through the use of insects. MSU photo by Kelly Gorham. A Montana State University research scientist who for nearly 30 years has worked to combat invasive weeds in Montana has been honored for his efforts. 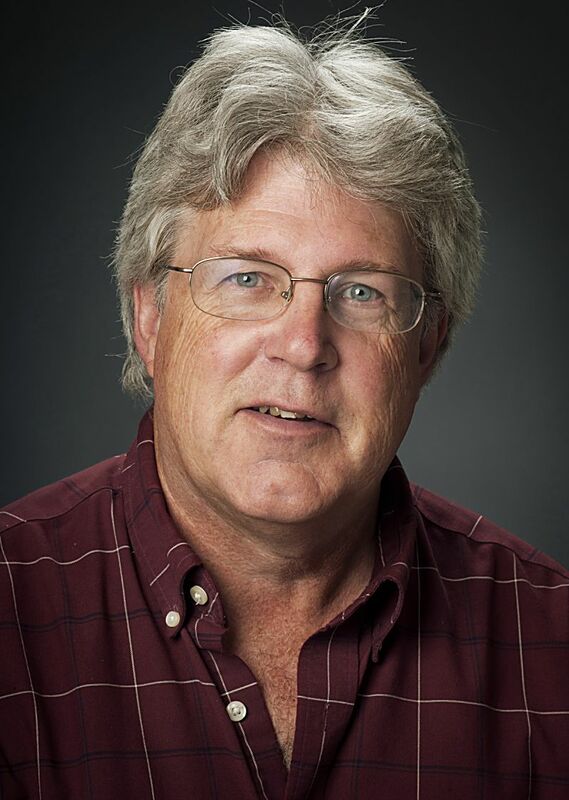 Jeff Littlefield, entomologist in MSU's Department of Land Resources and Environmental Sciences in the College of Agriculture, has received the Barb Mullin Lifetime Achievement Award from the Montana Weed Control Association, or MWCA. The award recognizes an agency employee, official or private individual who has been active in the MWCA for at least 10 years, demonstrates leadership abilities and successfully deals with agencies and the public in the MWCA noxious weed effort. Littlefield is quarantine director of MSU's Biological Containment Facility, where he researches the use of insects and mites as a biological way to control the spread of noxious weeds that threaten Montana's environment. According to the MWCA, state-listed noxious weeds infest approximately 7.6 million acres of Montana land, with new and potentially devastating invaders ever present. In his role as director of the biocontainment facility Littlefield imports, rears and field tests biological control insects that might serve as natural enemies of noxious weeds. For new insect agents, he develops and submits risk assessments to the USDA Animal and Plant Health Inspection Service, or APHIS, for the field release of potential agents. He also works to maintain the facility's accreditation with APHIS and supports research efforts of other biological control researchers by providing quarantine space. Littlefield's colleagues and Montana agency stakeholders nominated him for the award, citing in the nomination letter Littlefield's "clear vision for the ecological sustainability of using insects to suppress weed populations. "This is most evident when the noxious weeds are on a scale that simply cannot be approached using herbicides, often on thousands of acres of range and wildlands," the nomination states. "In other words, because of Dr. Littlefield, managers of private and publicly owned lands have the option of biological control to manage noxious weeds as part of an integrated pest management approach." Littlefield's research has led to the release of many potential biocontrol insect species that are impacting noxious weeds introduced from Europe and Eurasia that have taken over Montana's landscapes, said Steve Siegelin, MSU Extension director for analysis, planning and evaluation, in the nomination letter. "As a result of his work, native species are returning and the landscape is more diversified," Siegelin said. "His efforts epitomize outreach and engagement in a land-grant university. A need was identified; he has been actively involved in discovery, development and implementation strategies that are solving a problem facing land managers in Montana and throughout the region." Littlefield serves on or leads a number of consortia groups that pool their resources for projects overseas, as well as task forces made up of state and regulatory personnel and local land managers that focus on the importation, release, establishment and monitoring of biological control insects that target noxious weeds in Montana and neighboring states. He also led the development of the Montana Action Plan for the Biological Control of Invasive Plants. Littlefield's colleagues call him the "go-to person" for information on biological control of noxious weeds for Extension faculty, county weed coordinators, state and federal agency personnel and researchers who are interested in weed management but lack expertise in entomology. He has also shared his knowledge by training graduate students who have gone on to further biological control in Montana and by helping the Montana War on Weeds program develop an insectary at Whitehall High School for rearing and distributing new insect agents to combat Russian knapweed. "The department is so proud of Jeff and his accomplishments, which have made Montana a leader in biocontrol agent implementation for the region," said Tracy Sterling, head of MSU's Department of Land Resources and Environmental Sciences. "He implements these unique tools using his incredible knowledge base and the rich relationships he has built with practitioners across the state. This recognition is so very well deserved." In the nomination letter, Dave Burch, state noxious weed coordinator and program manager in the Montana Department of Agriculture, called Littlefield "a true pioneer in the field of biological control programs for noxious weed management. "Montana would not be as successful in the management of noxious weeds if it were not for Jeff and his lifelong dedication and accomplishments in the world of biocontrol," Burch said. Littlefield said he is honored to receive the award for a line of work in which results can take years to be seen, and that he didn't do it alone. "I have found that with biological control it helps to be an optimist and look to the long-term, for any success may not be measured for decades," Littlefield said. "Such awards give one pause to reflect on their career and life. I am resigned to the fact that in some cases I may never know how successful my efforts have been. "However, I feel and have felt very fortunate to have worked with a number of wonderful and dedicated people over the years — those that I continue to work with today and those who sadly are no longer with us," he added. "I feel in many ways that I am only a custodian of this award since I have relied on the advice, support and efforts of these people." In January, Littlefield also received MSU's Excellence in Outreach Award for his tireless service in managing noxious weeds around the state.